Tons of people want to read what's popular right now. So how do we get these popular books into the hands of our patrons who want to read them when they have long holds lists? 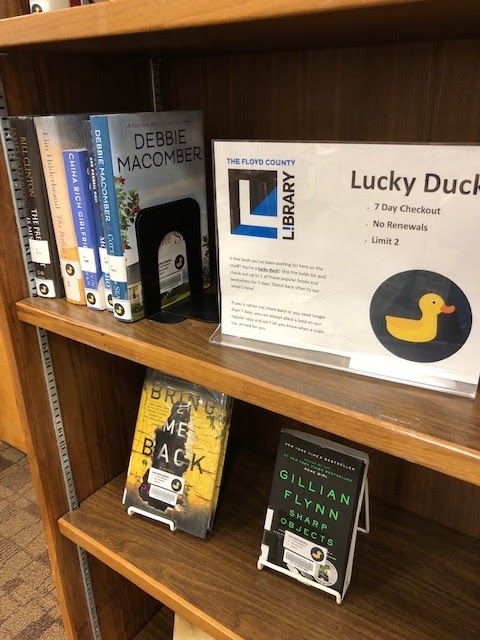 A photo of our Lucky Duck bookshelf with books and a display sign that explains the checkout rules for the books. One thing I've implemented is our Lucky Duck collection. 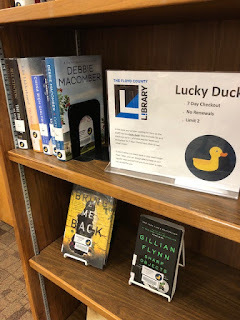 Lots of libraries have something like this - I've seen it called Lucky Day, Bestsellers, and Bestseller Express among other names. Basically, it's a collection of bestsellers and popular titles that have special checkout rules to ensure that they're on the shelf as frequently as possible. In our case, that means they check out for 7 days with no renewals and no holds can be placed on them. If a patron comes in and sees the book they want on the shelf and they want to read it right away, they're a lucky duck and can skip the long holds line! 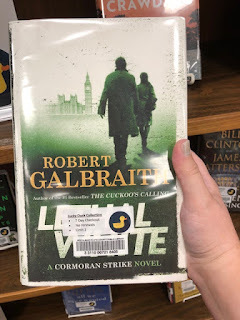 Photo of Lucky Duck book Lethal White by Robert Galbrait. The sticker reads "Lucky Duck Collection. 7 day checkout. No renewals. Limit 2." We still have copies of these books in our regular collections so you can certainly be placed on the holds list and wait your turn. I still purchase additional copies of popular books as the holds lists grow. But we wanted to give patrons a chance that the book that they want RIGHT NOW might actually be on the shelf for them if they came to visit us. For some popular books, a wait can be as long as six months until your hold comes in, and pretty frequently the wait list is at least a couple of months. Increased patron satisfaction - patrons being able to get the hot new book without having to wait months for their name to come up on the holds list. Increased staff satisfaction when they're able to show patrons a Lucky Duck copy instead of constantly telling them that they have to wait. Increased visits to the library - if patrons know there's a chance that the hot new book will be there for them, maybe they will visit the library more often to check. Smaller or more quickly moving holds lists - maybe some of the patrons on the holds list will check out the Lucky Duck copy instead. Increased circulation - since these popular books only check out for 7 days instead of 28 days like our normal collection, there's the potential to get LOTS of circs from each copy, making it a great investment for our library. There's no way with our ILS to have patrons who check out these copies automatically come off the holds lists. In order for the specific circulation rules to apply (the biggie is that these copies do not satisfy holds), they have to be placed on a separate record. This is not ideal, but even if a hold does come in for a patron who's read a Lucky Duck copy, the worst case is that it sits on the hold shelf for a week and then goes to the next patron. Because we don't charge fines, we don't have any consequences to try to ensure that the books actually come back in 7 days. I've seen some libraries charge higher fines on these items to try to get them back on the shelves. I was worried that people would just ignore the 7-day checkout, but for the most part they do seem to get back on the shelves quickly! I'm still trying to figure out a system for when to order a copy for the Lucky Duck collection. Since previously I would order an additional copy when our holds list hit 5 holds per item, that's what I'm looking at for ordering Lucky Duck copies. But it's not ideal - some authors I know are going to be so popular that I'm ordering enough copies from the start so that the holds ratio is not getting to five copies. Now that we have this collection, I will probably adjust my ordering of these known popular authors. And I haven't yet begun to think about how/when to weed this collection. I guess when normal copies of the books are appearing regularly on the shelves, it'll be time to take the Lucky Duck copy out and either make it a circulating copy or weed it. One reason I really wanted to try out this type of collection was so that we could have some popular adult titles on the shelf at our new Digital Branch, but circulation of browsing books has been low out there so far. I have to keep in mind that it's only been open about 6 weeks, so lots of folks have not yet discovered it. And I've found that many people hear "Galena Digital Branch" and think there are NO BOOKS there, which isn't true. I did a Facebook Live video last week when I brought out some new teen and children's books and I might try doing more of that to try to raise some awareness. We may find that folks prefer to just wait and pick up their holds at the branch (which they are doing PLENTY! ), which will be fine, too. So far, I'm seeing these books getting tons of checkouts and staff have been very enthusiastic about it, so it seems like it's working well for my library right now! Do you have a bestsellers or similar collection at your library? How do patrons like it? Do you have a system for what titles to add?